How did Elliott Woods, someone with only a high school education, become the sixth Architect of the Capitol? Described during his lifetime as hardworking and humble, Elliott Woods can be considered an American success story. Born in 1865 during his parents' overseas trip in England, Woods began his career with the Architect of the Capitol at the age of 20. By proving his mettle and dedication to the U.S. Capitol, he eventually became the trusted assistant to the fifth Architect of the Capitol, Edward Clark. During the last four years of Clark's life when he was in declining health, Woods acted as the de facto Architect in Clark's absence. With such a stellar reputation, many in Congress assumed Woods would be an easy appointment to the top job when Clark passed away in January 1902. There was glaring problem, however; Woods was not a trained architect and this was an unforgivable sin to many leaders in the architecture profession. Soon, some were actively working to thwart Woods' appointment, including Glenn Brown, the author of the two-volume "History of the United States Capitol." Considered the leading authority on the history of the U.S. Capitol, Brown was especially dismissive of Woods' possible promotion, as he coveted the job for himself. 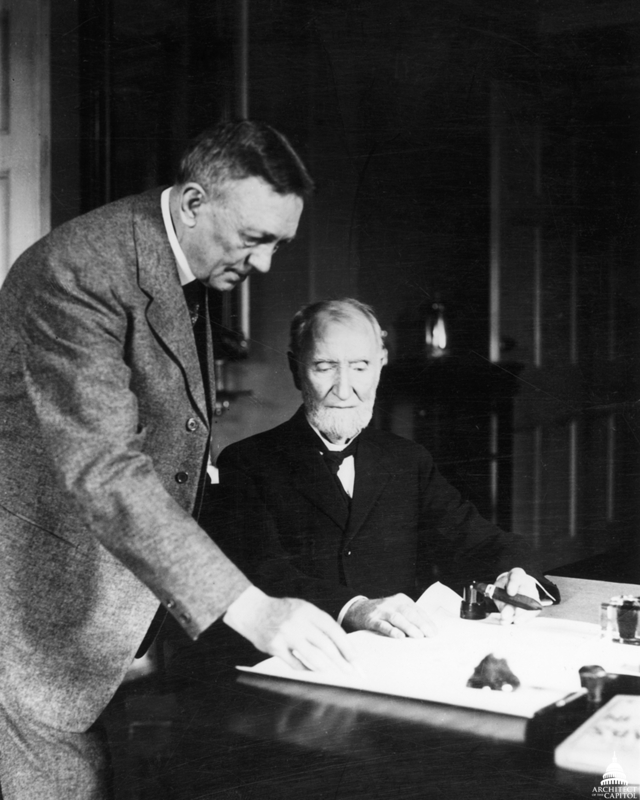 Elliott Woods, left, with Joseph Cannon, right. After much gamesmanship by Brown and others, Woods found a benefactor in Representative Joseph Cannon, then the chairman of the powerful House Committee on Appropriations. The appointment of the next Architect of the Capitol was ultimately the decision of President Theodore Roosevelt. A meeting between the two powerful men was convened, with Cannon even going so far as to suggest to President Roosevelt that if Woods was not hired, Roosevelt was risking a strained relationship with the House and Senate. According to Cannon, Congress – not the architectural profession – should choose the person who would be responsible for the care and upkeep of Congress' home turf. President Roosevelt agreed, although with a caveat. He wanted the name of the position to reflect Woods' lack of professional architectural training; Cannon suggested the title of "superintendent." In an appropriations bill passed in February 1902, the name of the office changed to "Superintendent of the Capitol Building and Grounds" and five days later, Woods was appointed to the post by President Roosevelt. Woods would oversee a significant period of expansion within the Capitol complex. During his tenure, the first two House and Senate office buildings were constructed (eventually named the Cannon House Office Building and Russell House Office Building, respectively), the Capitol Power Plant was built, and the U.S. Capitol underwent restoration work, including the stripping of white paint from the Rotunda walls. More mundane Capitol upgrades were made as well, such as the replacement of gas chandeliers with electric fixtures and the purchase of new toilet seats made from cherry wood at six dollars apiece. Woods even hired men, dogs and ferrets to root out and demolish the network of rats that had taken up residence in the Capitol. 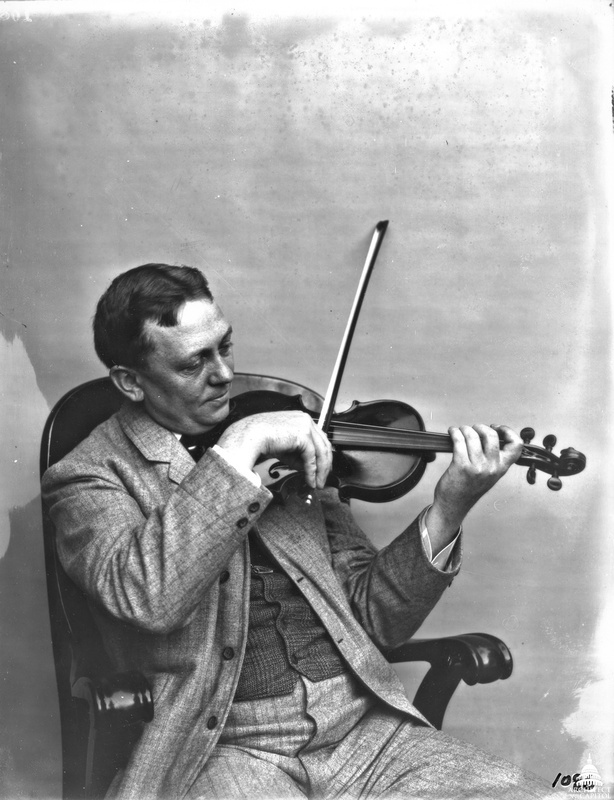 Elliott Woods playing the violin. Newspapers of the time noted Woods' vast reserves of energy and versatile pursuits. Joe Cannon was quoted as saying of Woods: "I do not know how Elliott Woods could be overworked unless he was hitched double with a mule." In his laboratory at the corner of Delaware Avenue and C Street, NE, Woods could be found conducting scientific experiments with wireless technology and X-rays. He considered exchanging telegraphic messages with ships crossing the Atlantic Ocean a relaxing pastime. Strains of his violin could be heard by people passing by his laboratory, and he was known to compose operas in his free time. Above all, Woods was modest and could often be seen amongst his employees in the boiler room, heating up his dinner. From time to time, he would even join his employees in a kazoo band, much to the annoyance of the policemen snoozing nearby. In 1921, to the delight of Woods, congressional action was taken to restore the office of the "superintendent of the Capitol" to the title of "the architect of the Capitol." The champion of the name change was Speaker Joe Cannon, Woods' original congressional supporter. This action was preceded by the election of Woods as an honorary member of the Washington chapter of the American Institute of Architects (AIA). Woods' years of hard work and toil were finally being recognized by the architectural community. During the spring of 1921, the honor was increased further by the election of Woods to become a full-fledged member of the AIA. Unfortunately, Woods would only be able to enjoy his new title for two years. While on vacation in May of 1923, he died of heart failure. Woods was 59 years old. Pall bearers at his funeral included Vice President Calvin Coolidge and Speaker of the House Frederick H. Gillett. 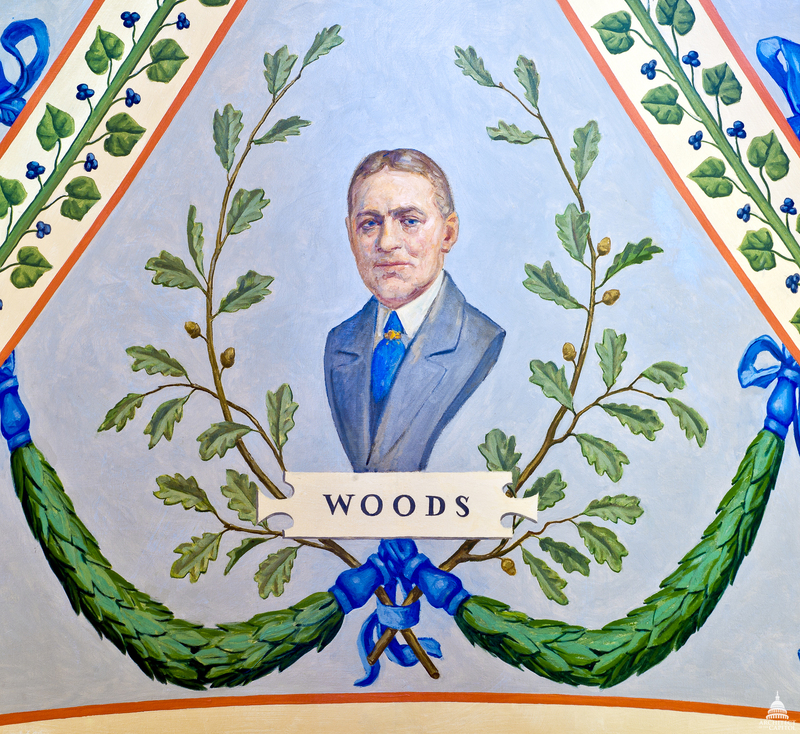 Elliott Woods' painted portrait in the U.S. Capitol's Cox Corridors. The legacy that Woods left behind remains a part of the fabric of Capitol Hill, especially in the Cannon and Russell Buildings, two of his crowning achievements. Today, the Architect of the Capitol is undertaking a multi-year renewal of the Cannon Building, as well as repairing the exterior stone façade of the Russell Building. Woods' influence, dedication and energy will continue to be reflected in these projects. These details and more on Elliott Woods can be found in "History of the United States Capitol: A Chronicle of Design, Construction, and Politics." Kristen Frederick is Communications Manager for the Cannon Renewal Project.